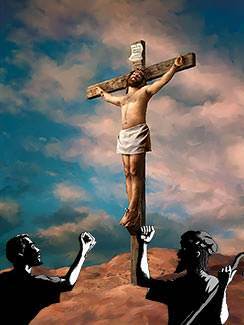 All believers know that Jesus Christ, the Son of God, died on the cross for their sins and rose again the third day. But not all believers know what happened when God's Son went back to Heaven. First, let us see how Jesus was received when He was here on earth, and then we will see what happened when He went back to Heaven. Jesus was rejected in the world. "The kings of the earth set themselves, and the rulers take counsel together, against the Lord, and against His anointed [the promised Savior], saying, Let us break their bands asunder, and cast away their cords from us" (Psalm 2:2,3). "He is despised and rejected of men; a man of sorrows, and acquainted with grief: and we hid as it were our faces from Him; He was despised, and we esteemed Him not" (Isaiah 53:3). What happened when God's Son came into the world? He was rejected. Even His own people, the Jews, rejected Him. The Bible says, "He came unto His own [people], and His own received Him not" (John 1:11). "And He [Jesus] began to teach them, that the Son of Man must suffer many things, and be rejected of the elders, and of the chief priests, and scribes, and be killed, and after three days rise again" (Mark 8:31). Christ rose from the grave. Jesus Christ died on the cross for our sins, just as He had said. But He rose again on the third day in a real body of flesh and bones. His resurrection proved that He was indeed the Son of God. The Bible says that Jesus Christ was "declared to be the Son of God with power…by the resurrection from the dead" (Romans 1:4). Jesus Himself had raised three people from the dead, but these people were simply restored to life in their human bodies. In time, they had to die like everyone else. But Jesus rose from the grave in a glorious, new resurrection body, different from anything seen before. 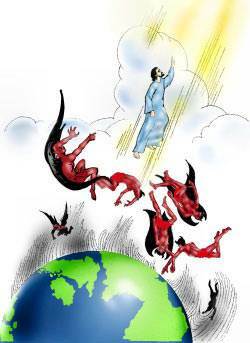 Jesus said, "I am He that lives, and was dead; and, behold, I am alive for evermore… " (Revelation 1:18). "For our conversation [citizenship] is in heaven; from whence also we look for the Savior, the Lord Jesus Christ: Who shall change our vile body, that it may be fashioned like unto His glorious body, according to the working whereby He is able even to subdue all things unto Himself" (Philippians 3:20, 21). Christ returned to Heaven in triumph. The ancient Roman generals used to return from their victorious conquests to a hero's welcome in Rome. The whole city would turn out in a giant celebration in their honor. The victorious general would ride into the city with his defeated enemies chained to his chariot. When Christ returned to Heaven, He returned as the mighty Victor over sin, death, Satan, and all the powers of darkness. He made a display of His defeated enemies. The Bible says, "Having spoiled [defeated] principalities and powers, He made a show of them openly, triumphing over them in it" (Colossians 2:15). 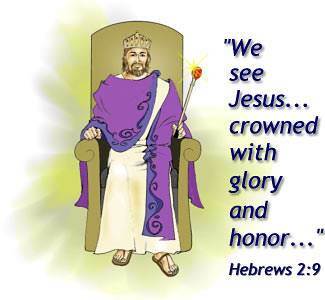 Christ was exalted to the throne of Heaven. The Father welcomed His beloved Son home to glory and gave Him the place of greatest honor and power. Throughout His life on earth, Jesus had glorified His Father. Just before He went to the cross, Jesus prayed, "I have glorified You on the earth … now, O Father, glorify Me…" (John 17:4-5). "…He [God] raised Him from the dead, and set Him at His own right hand in the heavenly places, Far above all principality, and power, and might, and dominion, and every name that is named, not only in this world, but also in that [world] which is to come" (Ephesians 1:20b, 21). The position given to Jesus Christ is far above that of any person, any angel, or spiritual power in the universe. The Bible says that God has put "all things under His feet." This means that everything in the universe is under the authority of the Lord Jesus Christ. Before He was crucified, Jesus taught His disciples that He would be rejected by men, suffer many things, and be crucified. 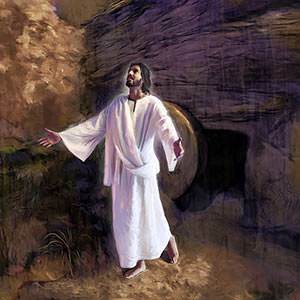 He would rise from the grave on the third day and, when He went back to Heaven, He would be glorified. "He that believes on Me, as the Scripture has said, out of his belly [his innermost being] shall flow rivers of living water. But this spoke He of the Spirit, which they that believe on Him should receive: for the Holy Spirit was not yet given; because that Jesus was not yet glorified" (John 7:38, 39). 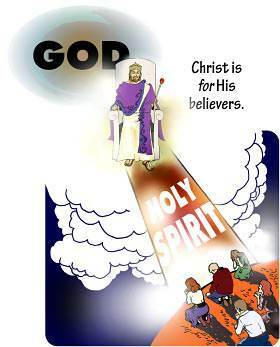 Jesus told His disciples that, when He was glorified and exalted in Heaven, the Holy Spirit would be given to them. Pointing to that day, Jesus said, "At that day you shall know that I am in My Father, and you in Me, and I in you" (John 14:20). Fifty days after Christ rose from the grave, on the feast day of Pentecost, 120 of Jesus' disciples were in an upper room in Jerusalem. Suddenly there came a sound from Heaven, like a mighty wind, and it filled the house where they were sitting. The Bible says, "There appeared unto them cloven tongues like as of fire, and it sat upon each of them. and they were all filled with the Holy Spirit… " (Acts 2:3, 4). The Holy Spirit had come! What did this prove to the disciples? It proved to them that the Man Jesus Christ was now glorified and exalted in Heaven. Soon a great multitude of people gathered. There were Jews from every nation. They spoke many different languages, but they were amazed because every man heard the disciples in his own language. Peter stood up and said to the multitude, "This Jesus has God raised up, whereof we all are witnesses. Therefore being by the right hand of God exalted, and having received of the Father the promise of the Holy Spirit, He has shed forth this, which you now see and hear" (Acts 2:32, 33). When we think of Pentecost, we often think of the miracles that took place that day, but the real meaning of Pentecost is that the Man Jesus Christ has been exalted to the throne of the universe. 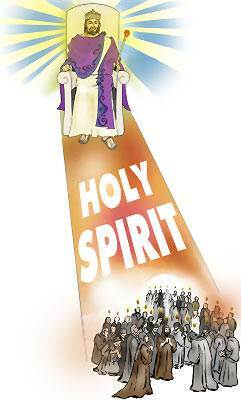 The Holy Spirit came down from the glorified Christ. Peter said, "Therefore let all the house of Israel know assuredly, that God has made that same Jesus, whom you have crucified, both Lord and Christ" (Acts 2:36). We have learned a great secret that the world knows nothing about. What is this great secret? It is this: Jesus Christ has been rejected in this world, but He has been exalted to the highest place in Heaven. If we could be lifted out of this world and taken to Heaven, the thing that would impress us most is that Jesus Christ has the place of greatest honor and power in Heaven. He has the highest place in God's universe. 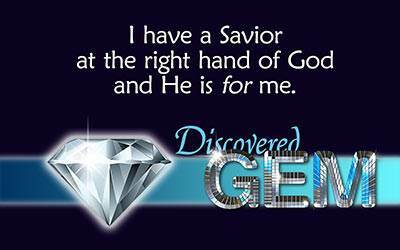 I have a Savior in glory. A young man was very anxious about his soul. He said, "I will pray to Jesus on the cross." A Christian lady said, "But He is not there now." When this young man realized that he had a Savior at the right hand of God, it made a great change in his life. And it will make a great change in our life as well. "But we see Jesus, who was made a little lower than the angels for the suffering of death, crowned with glory and honor…" (Hebrews 2:9). Jesus Christ loves His believers! He has always loved us. He will always love us. He proved His love for us by laying down His life for us. You may say, "Yes, but I have failed my Savior so many times, and I fail Him now." That may be true, but it does not affect Jesus' love for you. Jesus said to His disciples, "As the Father has loved Me, so have I loved you: continue in My love" (John 15:9). These disciples had been with Jesus for three years. They had seen Him do mighty works. They knew that He loved them and they loved Him. Yet, when He was betrayed by Judas and arrested, all of His disciples abandoned Him. The Bible says, "They all forsook Him, and fled" (Mark 14:50). 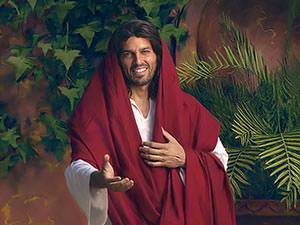 Did Jesus stop loving His disciples? No, He did not. The Bible says, "…having loved His own which were in the world, He loved them unto the end" (John 13:1b). The Lord Jesus knows all about me. He knows all about my failures, but that does not stop Him from loving me. It was a wonderful moment for me when I learned that Jesus loves me with all His heart. My Savior is for me. Jesus Christ, the Son of God, laid aside His glory and came into this world for us. Jesus said, "The Son of Man came not to be ministered unto, but to minister [serve], and to give His life a ransom for many [His believers]" (Mark 10:45). Jesus Christ suffered and died for us. We were the ones who had broken God's holy laws. We were the ones who were under the sentence of death. But Jesus took our place and died for us. The Bible says, "For Christ also has once suffered for sins, the just for the unjust, that He might bring us to God…" (1 Peter 3:18). Jesus Christ was raised from the dead for us. The Bible says that He was "delivered for our offences, and was raised again for our justification" (Romans 4:25). Jesus Christ is now in Heaven, at the right hand of God. He is there as a glorified Man, and He is for us—His believers. The Bible says, "For Christ…[has entered] into heaven itself, now to appear in the presence of God for us" (Hebrews 9:24). What does this mean? 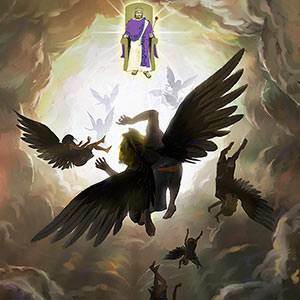 It means that the Man, Jesus Christ, is now on the throne of Heaven, and He is for His believers here on earth. The Holy Spirit connects me with my Savior in Heaven. The Holy Spirit is here to comfort us. The Holy Spirit is our connection with our glorified, exalted Savior. He is here to comfort us while we are separated from Him. Christ said, "I will pray [to] the Father, and He shall give you another Comforter, that He may abide with you for ever" (John 14:16). The Holy Spirit is here to teach us. In all the universe there is only one Person who can reveal spiritual truth to us, and that Person is the Holy Spirit. Christ said, "But the Comforter, which is the Holy Spirit, whom the Father will send in My name, He shall teach you all things…" (John 14:26). The Holy Spirit is here to tell us about Christ and His glory. The Holy Spirit does not speak of Himself, nor exalt Himself. He is here to testify of Christ and to exalt Him. He testifies of the glory of Christ at the right hand of God. Christ said, "But when the Comforter is come…He shall testify of Me" (John 15:26). "He shall glorify Me: for He shall receive of Mine, and shall show it unto you" (John 16:14). It is a great and wonderful thing to know that my Savior is glorified and exalted in Heaven and that He is for me. And it is a wonderful thing to know that the Holy Spirit now lives in me. He is my connection and my link with the glorified Christ.